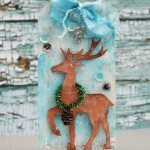 While creating my version of Tim’s tag for this month I also took pictures of the steps. 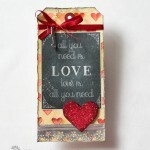 So now I can not only show you the finished tag but also how is was created. Step 1. I started by making my own “washi tape”. 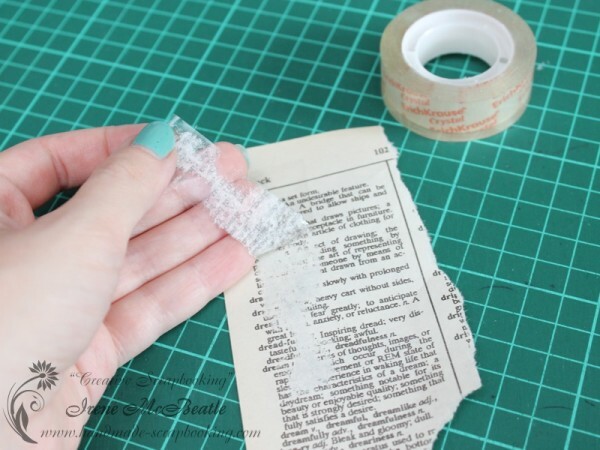 So I cut the strips of simple clear scotch tape and adhered them to some sheets from a dictionary. When you pull those strips off they take a layer of paper with them. Step 2. 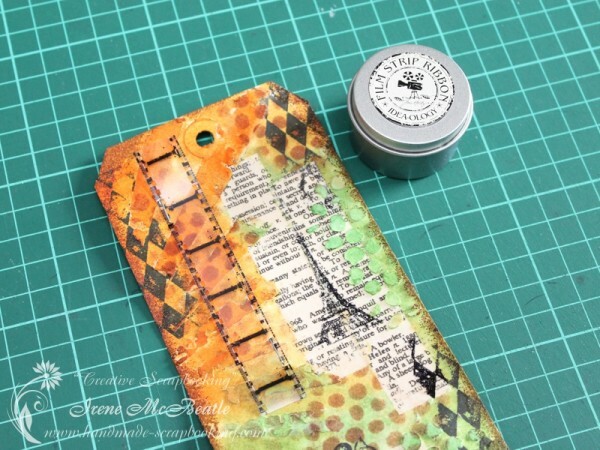 I glued my custom tape on a standard manila tag with liquid glue. After that I used black Ranger Archival Ink to stamp some images and patterns. 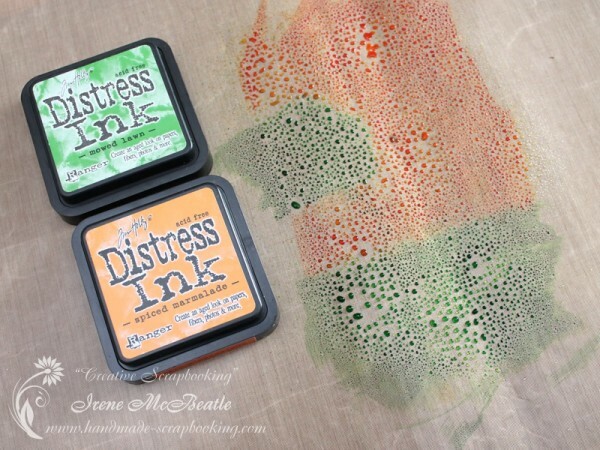 This ink dries on scotch tape permanently. Step 3. 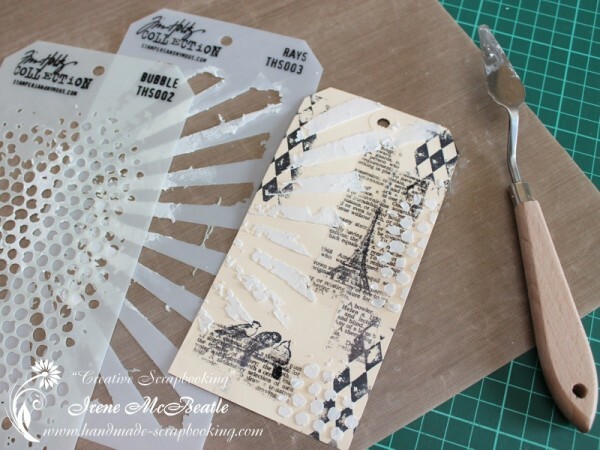 I added white texture paste using Tim Holtz stencils: Rays and Bubble. Then I waited till it dried completely. Step 4. 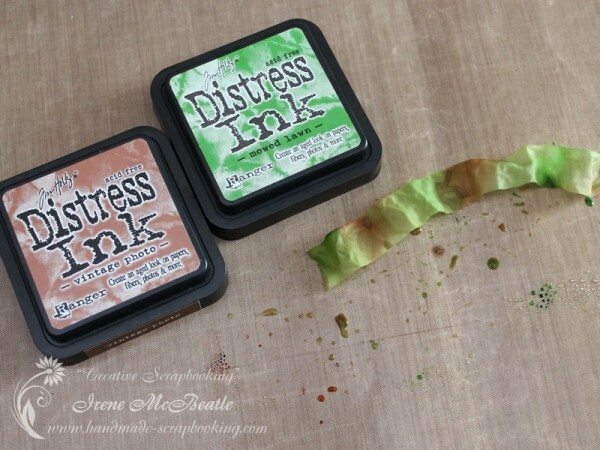 To color my background I chose two colors of distress ink: Mowed Lawn and Spiced Marmalade. I squished the ink pads on my non-stick sheet and spritzed the ink with water. Step 5. The next step was a little messy so I didn’t take it on camera. I turned my tag front side down and put it into the ink pressing it down. It required misting some water on the tag too to get the ink moving. I used my heat tool to speed up drying. 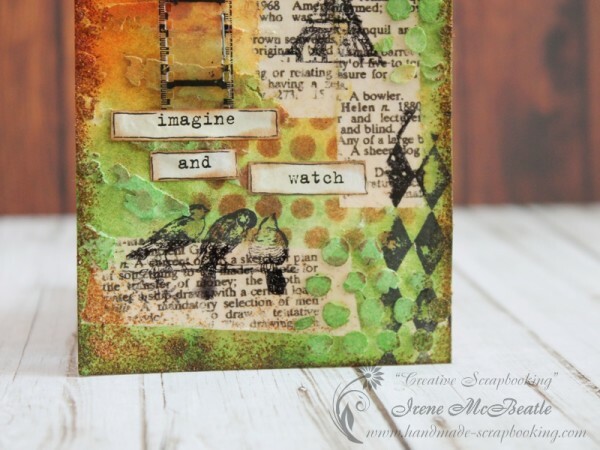 Texture paste absorbed the color while scotch tape resisted ink and water. Step 6. 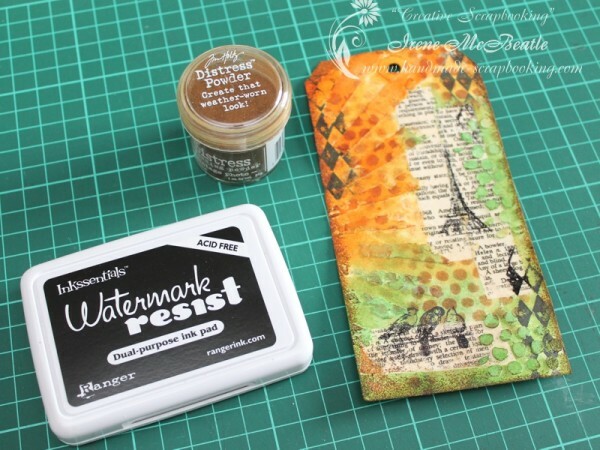 I took Bubble stencil again and used ink applicator tool to add Vintage Photo ink on some areas of the tag. Step 7. 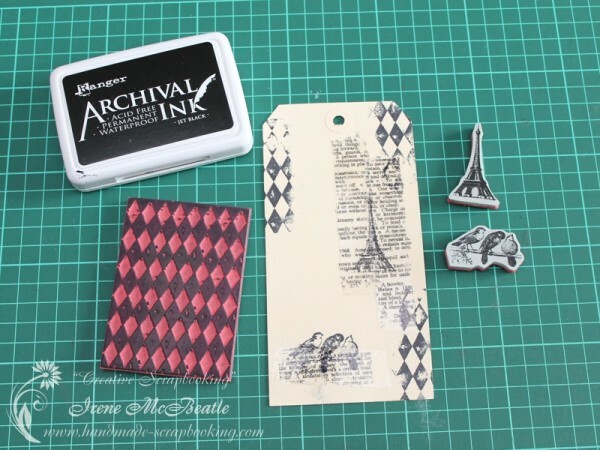 Now I put clear embossing ink on the edges of the tag directly from the ink pad. 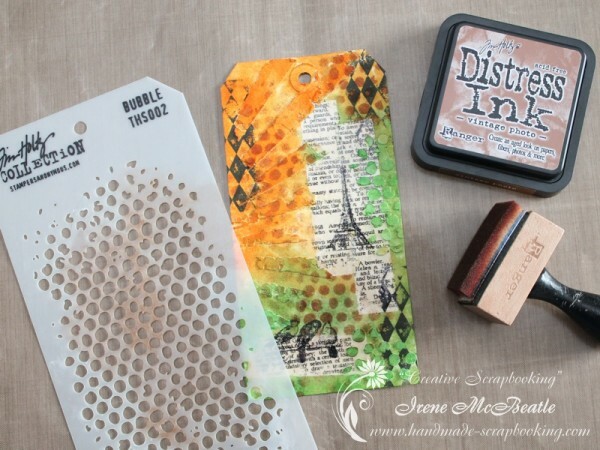 Then I spritzed Distress Embossing Powder over it and heat embossed. Step 8. I stapled a trim of Ideaology Film Strip Ribbon on the tag. I love how realistic it looks. Step 9. I also cut some Crinkle Ribbon and colored it with Vintage Photo and Mowed Lawn distress ink by adding water. When it was dry I tied it on the tag. Step 10. 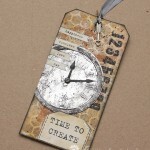 For the decoration I created my own clock element. 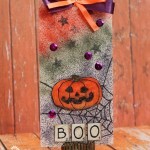 I used a stamp on cardstock and cut it out. Then I adhered acrylic circle on it using Glossy Accents. Step 11. I had some words printed on my computer. 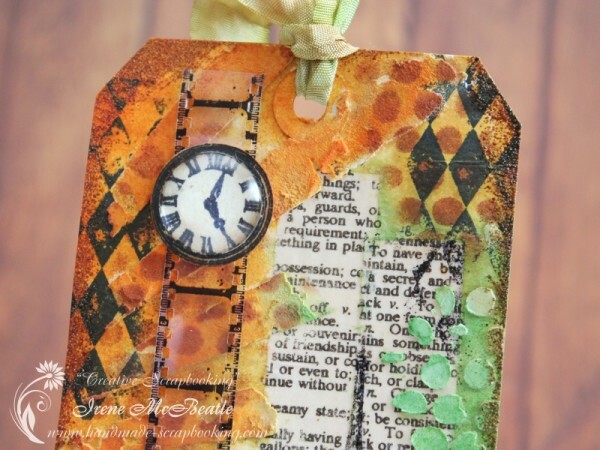 So I cut the paper, toned it with distress ink and glued down on the tag. 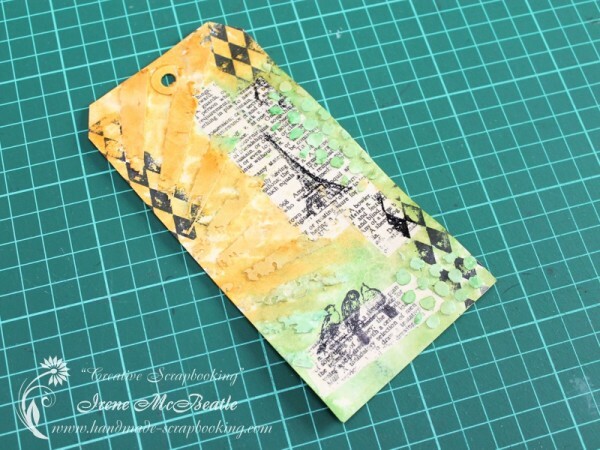 I enjoyed creating this tag. I hope that you will like it too. I love you tag! My favorite part is the way you made your own “tissue tape”. What a great idea. Your tag is awesome!! Your background is inspiring!! Thanks so much for the tutorial. Congratulations! 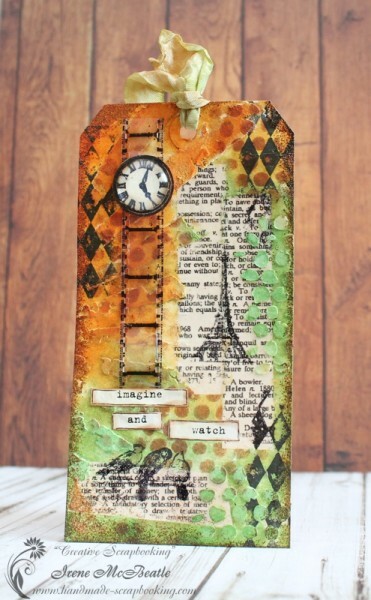 Your tag is beautiful and I love the homemade washi tape. 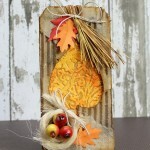 i so love your tag and the step by steps! i have to say thank you for the ‘creating your own tape’ technique. i really must try that sometime!